What a big difference in my knitting this year compared to 2009! I knitted the same amount of time, actually less if you consider the nights I spent dyeing, re-skeining and winding yarn. Not to mention, organizing my sizeable stash and cleaning up my pattern stash too. In short, there was a lot of time devoted to all aspects of knitting. The only part I didn’t dabble in was designing. I leave that to the talented folks I know. And so, as is customary, read more for details of my knits of 2010. Socks – 10 pairs this year, 4 of which were test knits, 2 were from the Rockin’ Sock Club and one was an improv. Hats – wow! Record year for me, 14 hats in total. 3 of which are Koolhaas Hats, another 3 are Sockheads. I also knitted my first Ysolda hat. 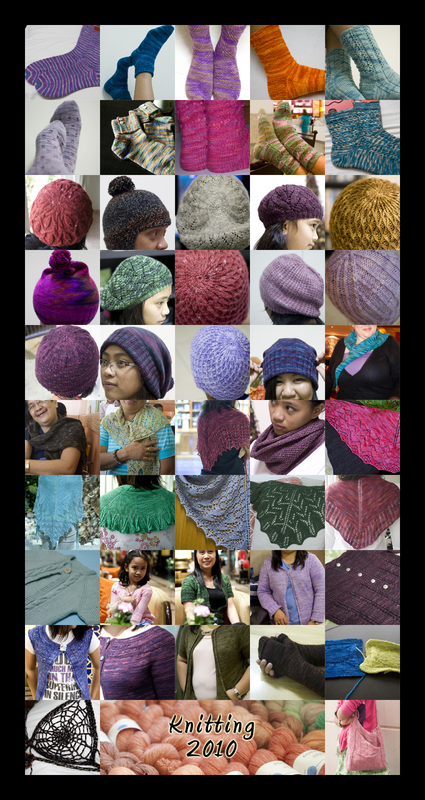 Shawls – I loved knitting all these shawls, but none more so than the Seraphim Shawl. Cardigans – 8 of them! Wow, I’m actually surprised with that. I plan to knit more in 2011, at least 6 cardigans for myself and then maybe for a few family members, if time permits. I seriously need to bust the stash! Others – this include a peek-a-boo brassiere, a felted bag, a pair of fingerless mitts and two squares that made up the blanket of Sundara love! Looking back this year, how did you feel your craft has changed? I think I actually became lazy this year. After completing and exceeding my goal of 12 pairs of socks in 2009, I sort of felt that I accomplished so much so I can sit back. But skill-wise I think I have gotten better. With the exception of colourwork and beads, I have been fairly confident about trying everything else. I even modified projects so much that I applied knitting math! Did you finish most of the projects that you planned to knit/crochet? Erm, no. The queue is always changing, sometimes depending on my mood or some new stash I acquired that I want to knit with rightaway. But out of the projects I started this year, I frogged one and two are hibernating. So I think I’ve done well. Were there are projects you wished you knitted/crocheted this year but for some reason was not able to do so? Of course! Could be because I lost love for the pattern or just felt that I would not be able to do it justice. How did you improve as a knitter/crocheter? Did you try anything new this year? I’ve become more confident I think. Plus yes I did try something new which is knit more garments and actually complete them. How do you see yourself and your craft in 2011? Are you planning on expanding into designing maybe? No designing ambition here, thanks. I’ll leave that to Lindsay, Caroline and Dieuwke! However I do plan to make a better effort at dyeing. I felt that I stuck to my comfort zone too much and dyed mostly solid colours. I want to do more variegated colours and even go so far as limit colours to match the season. No that it would be any good here as we only get two types of season in the UAE: hot and hotter! Six, but make that 8 including those in hibernation. That’s 2 hats, 1 shawl, 1 infinity scarf, 2 pairs of socks, 1 shrug and 1 pullover which actually only has the first two rows of bottom ribbing! What knitting/crocheting resolutions have you made or plan to make for 2011? **rubs hands** Now this is the exciting part. Some of you might already know that I signed up for the Super Special Six Pattern Sock Club 2011 group at the invitation from our dear Charmaine. Lindsay is in it too. So the idea is you have 2 months to knit a pair of socks from stash and the patterns are pre-determined. If I stick to schedule as I did in 2009 I can do one pair a month for this club and still do another pair from my normal queue. I think I will go back to casting on both socks at the same time, on two separate needles, from outside and inside the ball. Then there is a Personal Sweater Club with Preeti, which I am really excited about. We have already queued two cardigans using our respective Madelinetosh Sweater Club shipments and, get this, we have also done gauge swatches! Aren’t you proud of us? For 2011, my definite queue consists of 11 pairs of socks (for now), 9 cardigans/sweaters and 10 shawls/scarves. Quite modest, so I hope I get to complete them all. Yay! That is brilliant! Tuesday can’t come around quickly enough for you, yeah? Enjoy and let me know if you have any questions. I would like to help as much as I can. BRAVO!!!! That’s fantastic, what a great year it’s been for your knitting and for Dubai Knits! Here’s to an even more fabulous 2011! BTW, I love that we’re doing a the Personal Sweater Club together. I cast on for my Dark and Stormy today and knit one measly row. But I have to say, I loooooove the Vintage!